Each patrol car, fire engine, and ambulance has a two-way radio installed to allow rapid communications between these first responders and their dispatch center or Public Safely Answering Point (PSAP, where 9-1-1 calls are answered) to control and coordinate their safety and lifesaving actions. Most officers and firemen also carry a handheld radio on the same radio system. SchoolSAFE is the exact same type of public safety radio, and a second radio associated with the communications used within the school. School personnel located near the incident can provide real time information about the situation to assist rapid and succinct actions by the first responders. Not only can the school call the public safely field units on the radio, but the PSAP dispatch or responders can also call the school to alert them to lock their doors or take other emergency precautions based on the incidents outside the school. This will prevent unanswered phone calls or other failures. School staff or security responds to an incident. After calling the 9-1-1 center, more information is needed. No one now is answering the phone back at the school. How do the first responders know the latest location information or status of the incident? SchoolSAFE bridging is based on industry standard devices that are time tested and reliable. Complex public safety radio systems regularly use similar equipment for temporary patches to outside radio systems. This is where SchoolSAFE Communications differentiates itself from temporary radio patches. 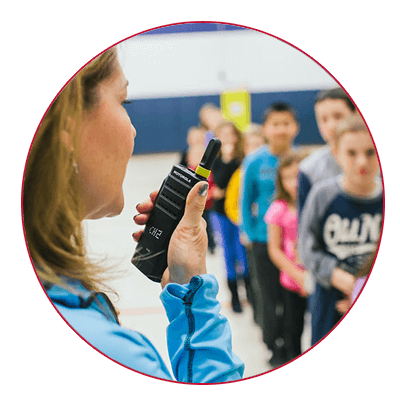 SchoolSAFE equipment is permanently installed and intergrated into school and public safety data networks to allow remote activation and deactivation, and select personnel alerting. Package documentation will describe how to schedule regular test and excercises to insure the equipment is useful in an emergency situation. The involvment of public safety officials in your area is encouraged and can be paramount to making the system functional and reliable. With their involvement, radio interoperability is recognized as conducive to their response and important to the safety of their citizenry. SchoolSAFE Communications with Enhanced Notification Software works in conjunction with Remote Activation to inform and warn students and faculty via e-mail, that a SchoolSAFE event is in progress. Enhanced notification provides awareness to those who need it so the utmost command and control over schools and first responder resources can be attained and situations can be handled most effectively.